¶ 1 Leave a comment on paragraph 1 0 In 1973 the Congress of Affiliated Councils was established to facilitate NCFR Affiliated Councils’ activities. All regional representatives and Council presidents comprised the Congress. The Congress was represented on the NCFR Board of Directors by its Chair and Chair-Elect, who were elected by the Congress. ¶ 2 Leave a comment on paragraph 2 0 It became possible for Affiliated Councils to receive tax exemption under the umbrella of NCFR. 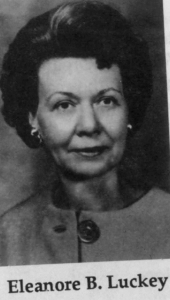 In addition, a President’s fund, consisting of unused monies from NCFR Presidents’ allotments, was established by Eleanore B. Luckey to provide matching funds for proposals from the Affiliated Councils.